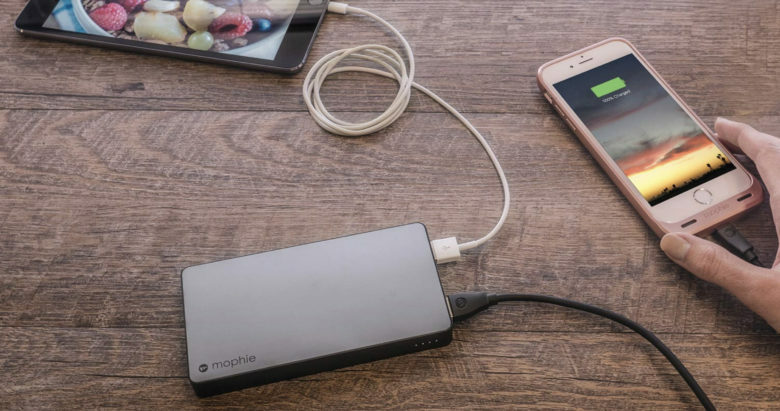 Travelers who don’t want to worry about finding electrical sockets for their iPhone or iPad should look no farther than the mophie Powerstation XXL. This external battery is relatively portable but still packs enough power to fully recharge an iPhone XS Max more than 4 times. AdvertisementEven better, this accessory gets its power through a Lightning port, and it can charge three devices at once . We put the Powerstation XXL through a complete set of tests and bring you the results . The market for phone batteries is flooded with small, cheaply-made options. The powerstation XXL is the exact opposite. It’s designed for people who want reliable power on the go… and who want a lot of it. The Powerstation XXL doesn’t try very hard to be fashionable. It’s just a rectangle, though mophie does offer it in space grey or rose gold. Powerstation XXL comes in rose gold, and also space grey. The outer casing isn’t cheap plastic. No, the entire exterior is aluminum. It’s tough enough to survive the most crowded gear bag. And it won’t take up too much room: this accessory is smaller than a paperback — 3.6 x 6.1 x 0.8 inches — and just under a pound. It’s durable on the inside too. mophie promises the Powerstation XXL is good for over 500 recharge cycles. That’s something you don’t get with cheap batteries. On one end are three USB-A ports. Two of these provide up to 2.1amps, while the third offers just 1.0amp. Naturally, this affects charging times, but more about that in a minute. There’s no USB-C port so this battery won’t be able to recharge your new 2018 iPad Pro, but it can handle any iOS device before that. And the USB-A ports can also send power to Android devices that have a micro-USB port. On one side of the Powerstation XXL is a Lightning port. This allows you to charge this battery with the same cables you use for your iPhone or iPad. All too many rival batteries require a micro-USB cable to do this job. Just keep in mind that mophie doesn’t include any Lightning cables. You’ll have to provide your own to recharge this accessory, and to charge your devices. On the opposite side of this super-size Powerstation is a power button. It’s necessary to push this to get this accessory to start sending power to your computers. Just connecting the two isn’t enough. Right beside it is a series of 4 while LEDs to indicate how much power remains. These also blink when the battery is charging. This mophie battery can hold 20,000 mAh. However, knowing how many recharges it will give your device isn’t as simple as dividing the storage capacity of this accessory by the capacity of your iPhone or iPad. No battery is 100 percent efficient. We exclusively used the Powerstation XXL to recharge an iPhone XS Max over multiple cycles. It was able to completely recharge this super-size phone 4.35 times, going from 0 percent to 100 percent. Given that the XS Max has a 3174 mAh built-in battery, then this external battery is 70 percent efficient, which is 10 percent higher than is typical. So to learn how many recharges you can expect to get for your particular device, divide 20,000 by the battery capacity of your device, then multiple by 0.7. Let’s look at the iPhone 7 as an example. This has a 1960 mAh battery, so 20000 / 1960 * 0.7 = 7.0, so expect 7 full recharges of your iPhone 7 from the Powerstation XXL. Two of the three USB ports on this peripheral provide 2.1 A of current. In our tests, these provided the iPhone XS Max slightly more than 1 percent of total charge every minute. On other words, 20 minutes of charging results on the battery level going up about 22 percent. The third USB port provides just 1.0 A. It provided our XS Max slightly less that 1 percent of charge per minute. Powerstation XXL can charge three computers at once. The time it takes to recharge this accessory from a wall socket is less straightforward. mophie doesn’t include a charger with this product, so you’ll need to use your own. And which one you use will have a tremendous effect on recharge time. We recharged our test Powerstation XXL with the 12V charger from an iPad, and it took almost 9 hours. Naturally, if you use a 5V iPhone charger it will take much longer. So plan accordingly. One of its better aspects is the built-in Lighting port. You can charge up this accessory with the same cable you use on your iPhone. The main downside of the powerstation XXL is the $99.95 price. There are certainly cheaper external batteries available. But consider an analogy: a Hyundai and a Lexus get you to the same destination, and the Hyundai costs a lot less. The Lexus, however, is better built and has extra features. The mophie powerstation XXL is like a Lexus. mophie provided Cult of Mac with a review unit for this article. See our reviews policy, and check out more stuff we recommend.